Continuing from previous pages on Canadian Niagara Power’s Rankine generating station, and Ontario Power Generation’s Sir Adam Beck I (SAB-1) generating station, this page outlines the oldest generating station in Ontario and one which is still producing power in 2008. Except for the photo above (taken from an OPG brochure and showing the complete plant including the oldest section to the left, modern addition to the right, and pentstocks), all photos were taken on a open house held Nov. 1, 2008 at the plant. Built in 1898, the Decew Falls plant was originally built by the Cataract Power Company of Hamilton, Ontario. It was originally built to provide power to the electric street railway in Hamilton – in those days many power developments in Niagara were intended for specific power markets – 34 miles away by transmission at 22,500 Volts (three-phase). Both the use of high voltage to transmit power that distance, as well as the use of three-phase and the relatively high frequency are unique features of this installation. The plant was acquired by the Hydro-Electric Power Commission (now OPG) in 1930 and continues to generate power for the province on Ontario. The plant itself was expanded several time with a second station added in 1943 to help supply power for the war effort. This plant was monumental and was awarded an IEEE historical achievement recognition in 2004 for pioneering the long-distance transmission of energy at high voltages. In 1898 the plant transmitted two-phase electrical power at 22.5kV, 66.66Hz from St. Catharines to Hamilton, a distance of 34 miles (prior to this, transmission lines were limited to less than a third of this distance and operated at much lower voltages). A scant ten years prior to this plant being built, Nikola Tesla proposed the use of “polyphase currents” which were used here in contrast to many contemporary systems that were either DC or single-phase AC – the Decew Falls plant was one of the first uses of Nikola Tesla’s concept. The Decew Falls plant is fed from Lake Gibson, a man-made reservoir at the top of the escarpment created in the late 1800’s to supply the city of St. Catharines with water. Lake Gibson was created by flooding the shallow valley of Beaverdam’s Creek (which originally flowed down the escarpment at Decew Falls) and is fed entirely from waste water from the Welland Canal. Historic Morningstar Mills was also fed from Lake Gibson. The story of this generating station begins in 1898, when the Cataract Power Company built the original station at Decew Falls. Water from the Welland Canal was drawn neat Allanburg into Lake Gibson (just south of Brock University), fed a single 1.8m diameter pentstock to generating units at the bottom of the Niagara escarpment (a 260 foot drop), and discharged into Twelve Mile Creek below which leads to Lake Ontario. In 1905 the reservoir at the top of the escarpment was expanded from the original area of 40 acres to 450 acres. 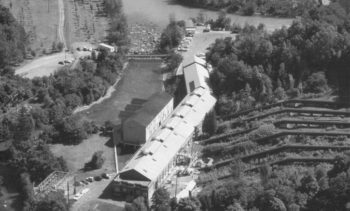 The original generating station consisted of a smaller building than that of today (old photos from 1903 do not show the transformer station in front nor the expansion of the main station to the north – the “bent” structure seen on the aerial photo). In 1898 the station consisted of two small 1700hp Stilwell-Bierce turbines coupled with 1000kW Royal Electric alternators. 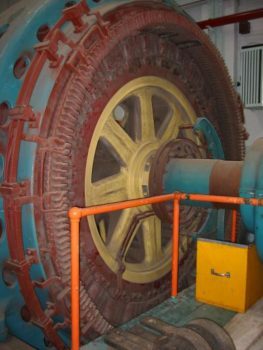 Two more units, 3300hp Manneret turbines, were added in 1903 and within two years four 7100hp Voith turbines (coupled with 5000kW Westinghouse alternators) were added – the four turbines manufactured by Voith are still in operation today. Of the eight turbines installed by 1906, six units were fully operational with two more planned and the plant was fed by four pentstocks (with the addition of two more planned when addition units came online). 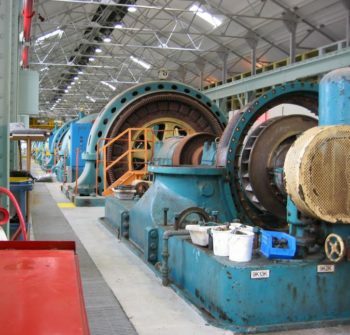 Two small turbines were also included to drive 50hp DC machines to supply excitation current to the alternators. The plant was expanded in 1911 again when four new generating units were added. Over the years, more generating units were added and four of the oldest original eight generators were shutdown in 1967 and removed in 1974. Today, six units are housed in the plant of which four 5000kW units are actively generating. As well, the small building in the front which was once the original transformer house from 1898 remains as a maintenance building. 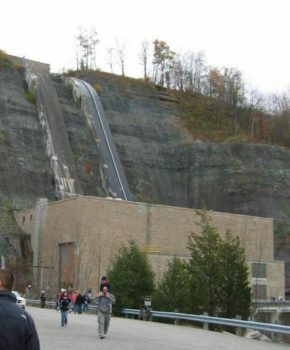 Water from Lake Gibson travels through these six pentstocks (6.5 feet in diameter each) down the Niagara Escarpment to the power station 260 feet below. In 1906, the design allowed for a draw of 700 cubic feet of water per second from the Welland Canal however the large reservoir allows a higher volume of water available for use during peak periods. Further enhancements were made to the Lake Gibson system to increase water flow. On display on the station floor are six generating units housed in the long building. Unit #9 is seen here inactive, with the turbine housing removed to reveal the blades inside. 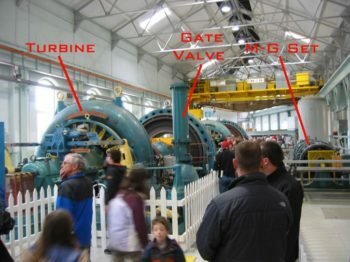 The draft tube, where water entering the turbine is discharged, is on the opposite side of the turbine (visible in the next photo). The orange steps in this photo allow servicing of the large bearing supporting the horizontal shaft. Immediately behind the turbine is the open-frame generator. This unit, at the west end of the plant, is out-of-service. At the other end of the plant, the first unit is also out-of-service leaving four of the six units currently operating. A view from the front-end of the same dismantled generating unit shows the side view of the turbine. The output shaft from the turbine extends to the right protruding through the draft tube and into the bearing and the generator. 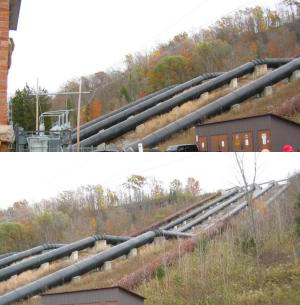 The draft tube, where water exits the turbine through the center, allows water to flow downward to discharge under the plant and into twelve-mile creek. 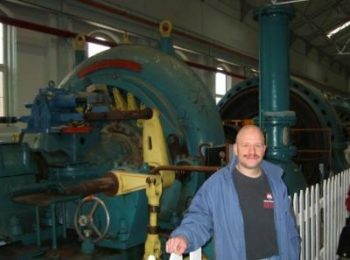 The old generators employed at the plant are horizontal-shaft units. Water flows through a hydraulically-actuated gate valve which regulates water flow into the outside of the turbine – several photos of the plant show large vertical hydraulic cylinders which operate the valves buried under the floor below. 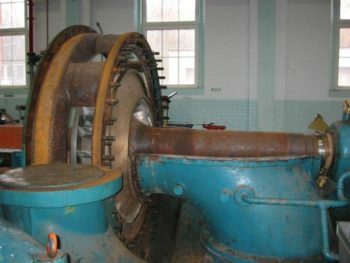 Water exits the turbine via a draft tube through which the rotating shaft protrudes and is discharged from the front of the plant into twelve-mile creek. 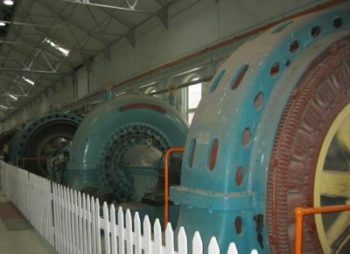 The rotating shaft from the turbine is directly coupled to the rotor of a large open-frame generator (the generator is seen in the right side of the photo). These turbines were built by “J.M. 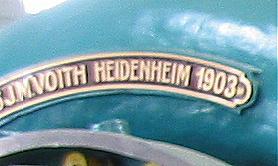 Voith Heidenheim” and are marked with dates ranging from 1903 to 1911. 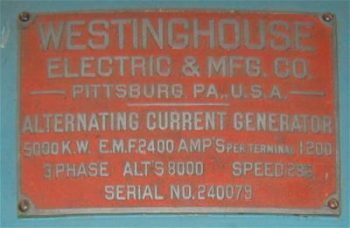 The closeup of a nameplate seen here is from unit #7 and is currently operating in the plant – it was one of the original eight turbines installed during the earliest days of the plant. A close-up view of a generator reveals rings where excitation current is fed to the rotor as well as multiple pole coils in the stator. Exciting current for the rotor is supplied via Motor-Generator sets located on the floor of the plant opposite the generators: these sets consist of a 3-phase AC motor (which operates from the grid) coupled to a DC generator. Originally operating at 66.66 Hz, the turbines were adapted to 60Hz in the 1950’s simply by slowing the shaft speed. Four generating units are currently operational with generators like these seen here, built by Westinghouse and producing producing 5MW each (Operating at a relatively high frequency of 66.6Hz, these generators are actually small for their output power compared to other contemporary generators at the time: the original old 25Hz generators in the Rankine plant were rated at 10.4MW each but were much larger). The generator was originally rated at a shaft speed of 286 rpm according to the nameplate seen here (the original generator was rated for an operating frequency of 66.6Hz). The generator is rated for an output voltage of 2200V. Total output power is 2200V * 1200A * 3^0.5 = 5MW. Decew Falls #1, then, produces a total output power of 20MW. 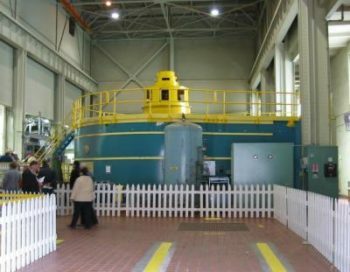 Another view of the station floor showing a turbine/generator unit, the vertical hydraulic cylinder which operates the gate valve to regulate the flow of water into the turbine, and the motor-generator set used to generate DC current for excitation of the generator. Almost as fascinating as the plant itself is the original use of the power it produced. A portion of the electricity produced was consumed in the city of St. Catharines only three miles away – it was transmitted that distance at the generation voltage of 2400 volts. The majority, though, was transmitted to Hamilton at 22,500 volts (later upgraded to 45,000 volts) via two three-phase transmission lines (one running below the escarpment and the other on top of the escarpment). The lines passed through two small sub-stations at Grimsby and Beamsville on route to two substations in Hamilton. The small substation in Beamsville housed two small transformers supplying lighting in that town. The terminus of the two transmission lines was the main substation was located at Victoria Avenue North about 1.25 miles from city hall. It was also on the Grand Trunk Railway line such that it could receive coal shipments directly from railcars for backup generators. In the substation, high voltage from the transmission lines was first reduced to 2,400 volt two-phase current. A portion of that power was then fed to two 8000 volt, 7 amp constant-current transformers used to operate 450 arc lamps in series on city streets. Another portion operated a motor-generator in which a 2400 volt two-phase motor was directly coupled to a 200kW 500 volt DC generator to operate DC loads such as elevators in the city (the generator was center-tapped so it produced 250 volt output – a standard DC voltage at the time). Finally, DC current at 600 volts (900kW in total) was also produced to operate street cars using three rotary-converters – this, originally, being the major electrical load for power from DeCew falls. The 600 volt DC source was also connected to a bank of lead-acid (called “chloride” at the time) batteries of 400 Ah capacity used as a backup for the street cars. A second substation in Hamilton (called “substation B” and located at Irondale near Burlington Bay) contained only transformers (originally 6,000kW capacity then later 12,000kW) and switchgear to distribute power. It was fed from high-voltage lines at 22,500 or 45,000 volts. Power from this substation was also used by industries such as the International Harvester plant and other factories. 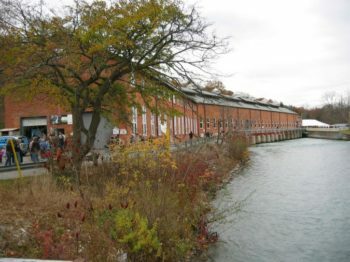 Aside from the two substations in Hamilton, two other steam-power stations in Hamilton, one on Guise street on Burlington Bay and the other at Hamilton Beach, supplied power for the street railway. The Guise street station was operating since 1892 on steam power but by the time the Decew falls plant was fully running in the early 1900’s both stations were not operating and held only in reserve should a problem develop with the water-power system which regularly supplied power for the system. In 1943 a second station was built beside the original plant to supply extra power for the war effort. Originally a 25Hz plant, it was converted to 60Hz in the 1950’s and continues to operate today with two 72MW generating units. A generator inside Decew Falls station #2. A modern plant, the short-vertical shaft technology (with the generator immediately on top of the turbine) employed resembles that used in the Sir Adam Beck plants in Queenston. This particular generator runs at a shaft speed of 171.4 rpm. I was sent an old 1906 article from “Electrical World and Engineer”. The first two pages of the scanned article may be found here featuring a map of the installation as well as old photographs (although the plant has hardly changed in 100 years). The reference to “Substation A” on the second page refers to the old station at Victoria Avenue North in Hamilton containing a bank of transformers as well as “rotary converters” – basically a motor-generator to convert AC into 500V DC for various uses including elevator motors around the city. Substation A also contained two 1MW steam-powered backup generators. It was recently (Feb 2010) noted by a reader (M. Andrews) that the pentstocks are removed and the plant shutdown. This person contacted Ontario Power Generation (OPG) and was assured by them that OPG intends to keep the plant running! In December 2008, OPG shutdown the Decew plant when the six 100 year-old pentstocks failed destructive metallurgical tests – the metal had thinned and fatigued to the point that the risk of failure was too great. Options included replacing the penstocks or adding a new generator to the newer DeCew 2 station. The DeCew 1 option was favoured and in July/August of 2009 all of the penstocks were removed (except for the upper portion of #7 which had been replaced a few years ago). Upgrade of four penstocks (for units 5 – 8) was completed in 2011 and the plant is operating once again. OPG goes on to state that they have been doing maintenance to preserve the building and equipment including brick work on the building. Looks like this piece of heritage is here to stay! I hope you enjoyed this tour of a third generating station at Niagara (the first being the Rankine station, an older plant located at the top of the falls and the second the Sir Adam Beck station in Queenston, Ontario, north of the falls). A professor at Niagara College in Canada, my personal interests extend to the history of technology. If you have any comments, you can contact me via the link in the left column of this page. Please refer to the ‘Decew Falls’ station on the subject line.